as a walk in the nature or a typical cuisine tasting. Moreover anything is this ancient house that holds, thanks to a successful restoration, the charm of the past and of the most authentic Sardinian tradition. A great and unique chance is to take the Little Green Train: there is a station close to the B&B. Located in the heart of Trexenta, historic region of Sardinia once called the "Granary of Rome", which embraces the northern part of the province of Cagliari. Mandas is a small town with 2,200 inhabitants and distances approximately 56 km from the main city of Sardinia "Cagliari". In spite of its size, Mandas boasts a very important history (it was the seat of a duchy in 1614) and is now an important railway junction, departure place of the Little Green Train of Sardinia. The Antica Locanda Lunetta is located in a small and quiet street in the old town. 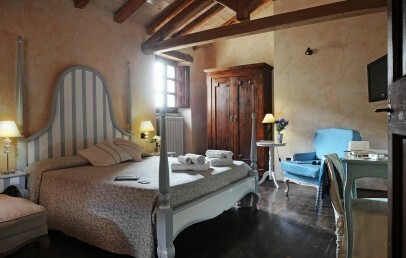 The Antica Locanda Lunetta has been created from a renovated old farmhouse and coaching inn. The warm and generous welcome of Barbara and Gian Luca along with Agostino immediately puts you at ease and allow you to savour the old atmosphere. You can relive the steps of the writer David Herbert Lawrence, who stayed here many times by the time the Locanda was called only "Lunetta" and managed by the great-grandfather of Barbara as well as mentioned in the famous book "Sea and Sardinia". The charm of its history is still alive and present in every corner of the structure, whose renovation was done in full respect of the tradition. Where possible, the original structure was maintained, as evidenced by the thick walls and the ancient stone staircase leading to the rooms. 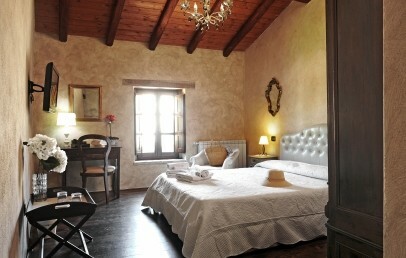 The three double rooms of the Antica Locanda Lunetta are located in the upper floors. Furnished with antique furniture, with wooden floor and exposed beams, convey a comfortable feeling of warmth and intimacy. The rooms and suites, whose width varies between 16 and 20 sqm, are equipped with television LCD, shower and central heating. Two of them can accommodate a third bed (on request). The breakfast is served in the pretty room near the entrance. The owners are happy to meet the needs of their guests who take the Little Green Train and need to have an "early" breakfast (before the normal breakfast time). The Antica Locanda Lunetta offers only breakfast and is glad to suggest good places where to eat, for example at the Agriturismo "Le Vigne Ducali" in Mandas or the restaurant "Osteria La Forchetta", only a few steps away, with local and seafood cuisine. Guests of the Antica Locanda Lunetta can relax in the living room by the fireplace or in the smaller room with Wi-Fi internet connection and TV. In the garden is a small but and comfortable gazebo where guests can enjoy the chilly evenings. A short distance away is the small train station, point of arrival and departure of one of the three lines of the Little Green Train: line Mandas – Arbatax. The Little Green Train is one interesting way to explore the island's inland, as it crosses through the very heart of the island with fascinating places. In the courtyard of the Locanda can be parked motorcycles and bicycles, instead for the cars a public parking outside is available. Other cultural activities during the stay can be a visit of the two local museums: Museum of Ethnography and Sacred Art Museum (closed Mondays). Double rooms with double beds, located on the first floor. 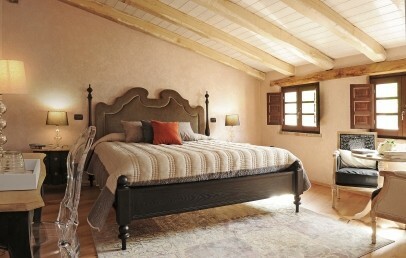 Very comfortable, with wooden floor and exposed beams, ancient furniture with simple and elegant style. 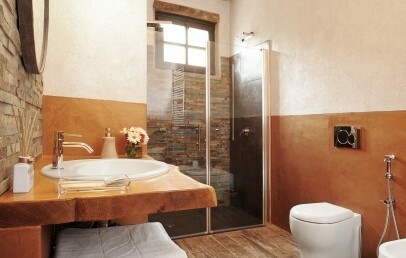 The bathrooms are modern and colorful, all with shower and complimentary toiletries. The small, nice windows overlook the street or the internal court. The thick walls and the silence of the area assure the most complete tranquility. The Suite Patio overlooks the hotel garden and offers a furnished patio with armchairs. The decor is a mixture of old and new, with a parquet floor of old oak, natural colors, a bathroom with a free standing tub, shower with hydrotherapy, chromo therapy and waterfall function. In addition, the Suite is equipped with LCD TV, air conditioning, central heating, safe, kettle with tea / herbal tea / coffee, hairdryer, free Wi-Fi, tablet supplied, mini-fridge, small welcome basket with typical local products. The Suite Melograno is located on the first floor of the building where once housed the stables. The view goes over the garden and the orchard of pomegranates. The atmosphere of the Suite is idyllic and warm, enhanced by antique oak parquet flooring and wooden ceilings .The bathroom has free standing tub, heated towel rails, shower with hydrotherapy and waterfall function. In addition, the Suite is equipped with LCD TV, air conditioning, central heating, safe, kettle with tea / herbal tea / coffee, hairdryer, free Wi-Fi, tablet supplied, mini-fridge, small welcome basket with typical local products.